Another good week for the mileage log with no injury setbacks…things may be looking up. For the first time in over nine months I experienced the elusive feeling of it feeling quite easy to run at a decent lick in training. At last I am making progress rather than incessantly worrying about which bit of me might wear out or fall off next. Seventy miles is my biggest week in almost a year. Unsurprisingly I feel tired, but happy to be seemingly recording improvement. I am hoping to run well at the Dewsbury 10K in three weeks. I was on for a probable personal best time there last year only to be thwarted by a course that was more 10.2 than 10 kilometres. I’m sure they will measure and mark it out right this year. To get the mileage in, I’ve had to do some double days, which I find hard. On Thursday I ran to work (5.5 miles) and for the return I took a longer route of 13.5 miles. It was an unappealing run against a constant stream of glaring headlights on a cold, dark night. However, I get a perverse enjoyment from completing this sort of run. I wrapped up well, plugged in my headphones and caught up on my podcast backlog and drifted away with my thoughts. I was home in what felt like no time, though it actually took me an hour and three quarters. We tried a new parkrun on Saturday – Selby. The course is around the bumpy perimeter path of an airfield, amazingly one lap of the airfield is exactly five kilometres. It was a chilly day and a brisk old breeze was scuttling through the windsocks. The course was billiard table flat so I was aiming for a sub 19 minute time, hopefully nearer to 18:30. It’s quite a new parkrun (this only was the fifth event), the field was around two hundred or so. Soon after the off, I was up in the leading group and after a kilometre I was off the front, running alongside a young lad in leggings and a club vest. I’d gone off hard, so my heart rate was up and I was gasping in the air, he casually turned to me and started chatting as if we were out for an easy walk. I gasped out a couple of one or two word responses, which I expect were entirely incomprehensible. He then asked me if I knew the way, “Erm, no, I was following you” I managed to blurt out. Thankfully, it was hard to go wrong, we stuck to the fairly obvious perimeter path and didn’t head down the runway. I managed to run the first (partially wind assisted) mile in just under six minutes, but the next was directly into the strong wind, we slowed to 6:30 pace. Just as we were turning back towards the finish, with the wind again on our backs, another runner breezed past. I tried for a few strides to stick with him, but clearly he had been holding a lot in reserve and he zoomed away easily. In addition to being bumpy, the path was covered in a couple of centimetres of mucilaginous mud. I had made a bad shoe choice and struggled for traction in the worst of it. With around 400m metres to go I decided to have a dig to try to steal second place from the young lad. I opened up my ‘sprint’. 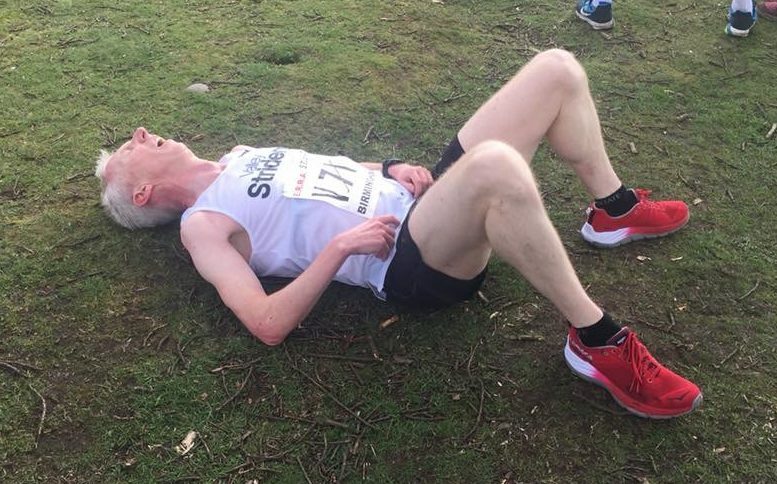 I am pretty good at reading other runners body language in races and as he floated effortlessly past me, his body language was saying “don’t be ridiculous, you have no chance of beating me”. He was right. I finished third in 18:56, given the wind and the mud, I was satisfied with that. On a dry still day I am fairly sure I could have maintained sub six minute mile pace the whole way. Next week – hopefully more of the same.